Competition for land is increasing as a consequence of the growing demands for food and other commodities and the need to conserve biodiversity and ecosystem services. Land conversion and the intensification of current agricultural systems continues to lead to a loss of biodiversity and trade-offs among ecosystem functions. Decision-makers need to understand these trade-offs in order to better balance different demands on land and resources. There is an urgent need for spatially explicit information and analyses on the effects of different trajectories of human-induced landscape change in biodiversity and ecosystem services. 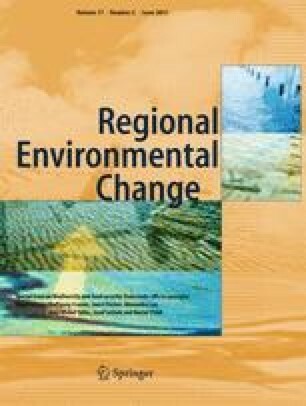 We assess the potential implications of a set of plausible socio-economic and climate scenarios for agricultural production and demand and model-associated land use and land cover changes between 2005 and 2050 to assess potential impacts on biodiversity in Uganda, Rwanda and Burundi. We show that different future socio-economic scenarios are consistent in their projections of areas of high agricultural development leading to similar spatial patterns of habitat and biodiversity loss. Yet, we also show that without protected areas, biodiversity losses are higher and that expanding protected areas to include other important biodiversity areas can help reduce biodiversity losses in all three countries. These results highlight the need for effective protection and the potential benefits of expanding the protected area network while meeting agricultural production needs. The online version of this article (doi: 10.1007/s10113-016-0983-6) contains supplementary material, which is available to authorized users. We would like to thank all participants of the scenario development process for their active contributions. This work was funded through a Grant from the MacArthur Foundation with funding for scenario development provided by CGIAR Research Program on Climate Change, Agriculture, and Food Security (CCAFS).